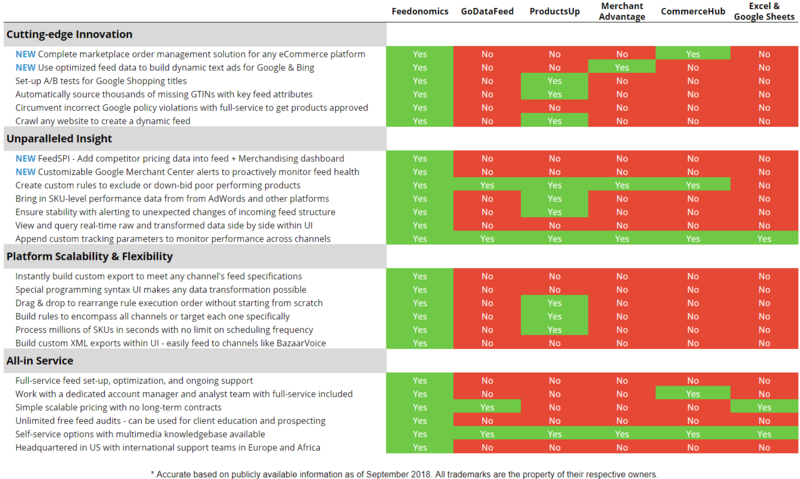 This comparison shows how Feedonomics compares to the most common feed management services. To establish which product feed platform is the best, we compared factors that are critical for growth and success in the modern world of eCommerce. To see the full in-depth Feedonomics platform, request a free demo with us and we will give you the grand tour. Complete marketplace order management solution for any eCommerce platform. Use optimized feed data to build dynamic text ads for Google & Bing. Set-up A/B tests for Google Shopping titles. Automatically source thousands of missing GTINs with key feed attributes. Circumvent incorrect Google policy violations with full-service to get products approved. Crawl any website to create a dynamic feed. Add competitor pricing data into feed 5 Merchandising dashboard. Customizable Google Merchant Center alerts to proactively monitor feed health. Create custom rules to exclude or down-bid poor performing products. Bring in SKU-level performance data from from AdWords and other platforms. Ensure stability with alerting to unexpected changes of incoming feed structure. View and query real-time raw and transformed data side by side within UI. Append custom tracking parameters to monitor performance across channels. Instantly build custom export to meet any channel's feed specifications. Special programming syntax UI makes any data transformation possible. Drag & drop to rearrange rule execution order without starting from scratch. Build rules to encompass all channels or target each one specifically. Process millions of SKUs in seconds with no limit on scheduling frequency. Build custom XML exports within UI. Full-service feed set-up, optimization, and ongoing support. Work with a dedicated account manager and analyst team with full-service included. Simple scalable pricing with no long-term contracts. Unlimited free feed audits - can be used for client education and prospecting. Self-service options with multimedia knowledgebase available. Headquartered in US with international support teams in Europe, Australia, and Africa. All charts on this page are accurate based on publicly available information as of September 2018. All trademarks are the property of their respective owners.